Dad went out to work the field in the afternoon on November 14, 2018, for the last time and that evening was reunited in heaven with his wife Bonnie. Howard Ebenhoeh was born on the farm in Maple Grove Twp. on March 15, 1931. 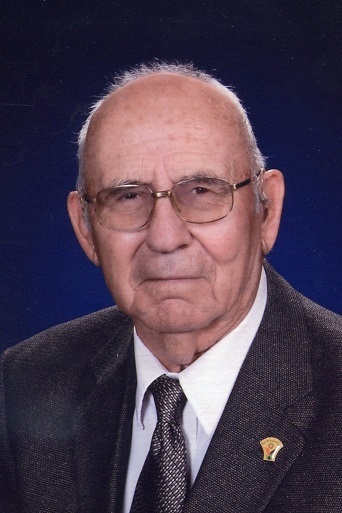 He was a man of Catholic faith, farmer, father, Papa, and friend to all. He married the love of his life Bonnie Jane Rice on August 1, 1953. They had eight children, twenty-four grandchildren, twenty-six great-grandchildren. Howard was a proud graduate of Saint Michael’s High School Class of 1949 highlighted with a basketball district championship. He took over the Edward and Edith Ebenhoeh family farm out of high school, married his wife, and was drafted into the military in 1955. After returning from service, Bonnie and Howard raised six children. Howard was active in Saint Michael’s Church, Saginaw County Farm Bureau, DHIA, Saginaw County 4-H, and the Saginaw County Fair. In 1978, they sold the herd, and in 1980 they opened the Chesaning Heritage House, where they went from producing the food to serving the food. Howard was lifelong member of the Chesaning Rotary Club and a Paul Harris Fellow. He was also recognized and honored as Chesaning’s Distinguished Business Person of the Year. The Chesaning Heritage House, Bonnymill Inn, and Carriage Shoppe offered employment to many Chesaning-area residents that became like family. Most everyone remembers him as a fixture in his chair in the back of the Heritage House. While Bonnie dished out food, Howard dished out directions. Howard was generous with prayer and treasure. Howard and Bonnie were very active in the Chesaning community and were very proud to be Chesaning Showboat Grand Marshals in 2000. Howard and Bonnie traveled to Haiti dozens of times to help the children and provide clean food and water. It became Howard’s passion for many years later. After the passing of his wife in 2003, he continued his service work with Rotary, Christian Fellowship of Farmers, Seventh Day Adventists to distribute much needed medicine, Polio vaccines, and supporting farmers in growing food. His passion for his faith led him to make multiple pilgrimages to the Holy Land and religious shrines. His last trip was to Poland in August of this year. He is survived by his children Howard and Denise Ebenhoeh, Ronald Ebenhoeh, Tim and Linda Ebenhoeh, Julie Leggett, Carol Wirgau, Barb and Jerry Birchmeier, his grand and great-grandchildren; his brother, Patrick (Judy) Ebenhoeh; his sisters, Eleanor (Carl) Drexler, Jane (Dan) Ruddy, and Jeanie Ebenhoeh; many nieces and nephews, and countless cherished relatives and dear friends. He was also preceded in death by his wife, Bonnie on December 10, 2003; his parents, Edward and Edith Ebenhoeh; his sisters, Henrietta (LaVerne) Birkmeier, Marie (Sandy) Schnell, Eileen (Louie) Birkmeier, Grace (Dominic) Sherry, Martha (Gordon) Krupp, and Margaret (Bill) Krupp; his brothers, Edward, Floyd (Irene), Vince (Doris) Ebenhoeh, and Don Ebenhoeh; his son-in-law, Greg Wirgau; infant sons, Jonathan and Dennis; grandson, John Eben Leggett. In lieu of flowers, please donate to Saginaw County Fair, the Chesaning CAER Center, or to the wishes of the family. Fr. Bob Byrne will officiate at the Mass of Christian Burial at 11:00 a.m. Saturday, November 17, 2018, at St. Michael Catholic Church of Maple Grove. Burial with military funeral honors will follow at St. Michael Cemetery of Maple Grove. Visitation will be from 1:00 p.m. to 8:00 p.m. Friday at Misiuk Funeral Home of Chesaning with a Vigil Service prayed at 7:00 p.m. Friday at the funeral home. His family will be present at the church to welcome relatives and friends from 9:00 a.m. Saturday until time of the Mass. You may light a memorial candle or share a memory at misiukfuneralhome.com.